Walkthrough: After defeating Faba, he will make mention of how Giovanni has brought the strongest minds from different universe to achieve his goal. After doing so, he will not impede your path inside. 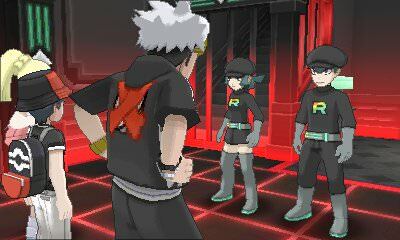 Once inside Team Rainbow Rocket's Castle, you will see that everything has changed. By heading into Lusamine's back room, you will find that the portal leading to the Preservation Room cannot be accessed, thus preventing you from finding Lusamine at this time. As you go to leave the castle, two Grunts will appear in hopes of stopping you. However, as they do, the former Leader of Team Skull, Guzma, will arrive. He has changed his ways, and he wants to help you defeat Team Rainbow Rocket. The two of you will then battle the Grunts. After defeating them, the two of them will open doors to both the left and right of the main area. This will allow your player to explore these areas in hopes of finding Lusamine, as Lillie hangs back in Lusamine's room to heal your Pokemon should they need it.